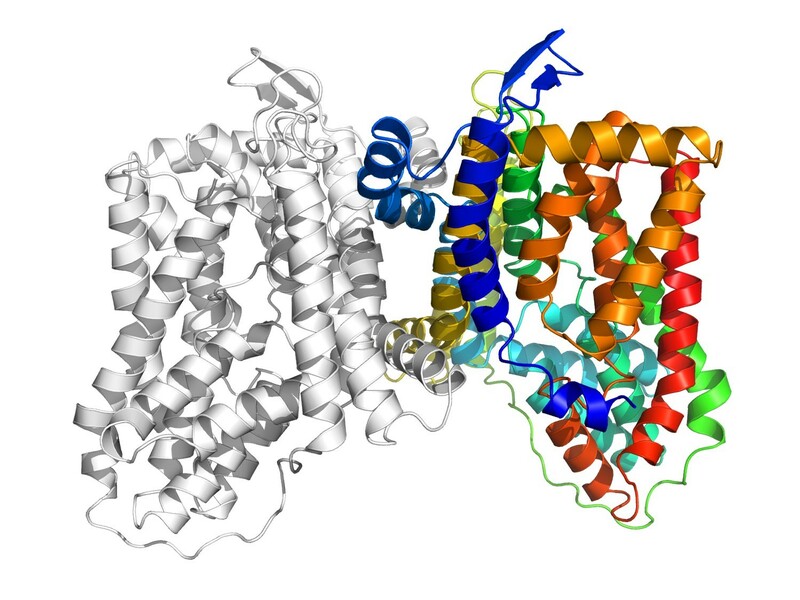 This ribbon diagram shows the structure of a protein pump known as YdaH. The pump removes certain antibiotics from bacteria, allowing them to resist medications. Larger image. Image courtesy of Edward Yu. AMES, Iowa – Research teams led by Edward Yu of Iowa State University and the Ames Laboratory have described the structures of two proteins they believe pump antibiotics from bacteria, allowing the bacteria to resist medications. One of the protein pumps, known as MtrF, is believed to be the mechanism that allows gonorrhea bacteria to resist certain antibiotics. The researchers studied the other protein pump, known as YdaH, in Alcanivorax borkumensis, a rod-shaped bacteria found in oceans that feeds on oil. It thrives wherever there is an oil spill and helps to break down the oil. The two are closely related members of the AbgT family of 13,000 proteins. “There was no structural information for these proteins, and functional study of them was very limited,” said Yu, Iowa State’s John D. Corbett Professor in Chemistry, a professor of physics and astronomy, a professor of biochemistry, biophysics and molecular biology and an associate of the U.S. Department of Energy’s Ames Laboratory. The studies reveal that when the bacteria detect the antibiotic sulfonamide, “they turn on these transporters and pump it out, assuring survival of the cell,” Yu said. With further study, he said researchers may be able to find ways to block the protein pumps and restore the effectiveness of the antibiotics. Nature Communications published the A. borkumensis discovery online today. Yu is the corresponding author. First authors are Jani Reddy Bolla, an Iowa State graduate student in chemistry and Ames Lab student associate, and Chih-Chia Su, an Iowa State associate scientist in physics and astronomy and Ames Lab associate. Iowa State collaborators are Feng Long, a postdoctoral research associate and Ames Lab associate; plus graduate students and Ames Lab student associates Jared Delmar, Abhijith Radhakrishnan, Nitin Kumar and Tsung-Han Chou. Kanagalaghatta Rajashankar – a senior research associate in chemistry and chemical biology at Cornell University in Ithaca, New York, and associate director of the Northeastern Collaborative Access Team facility at the Advanced Photon Source at Argonne National Laboratory in Illinois – also contributed to the paper. Cell Reports published the gonorrhea discovery as its April 7 cover paper. 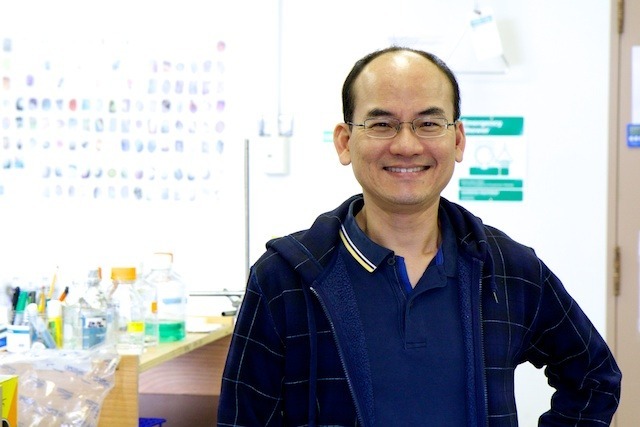 Yu is corresponding author and Su and Bolla are first authors. Collaborators are Kumar, Radhakrishnan, Long, Delmar, Chou, Rajashankar and William Shafer, a professor of microbiology and immunology at the Emory University School of Medicine in Atlanta. The studies were supported by a four-year, $1.2 million grant from the National Institutes of Health. The researchers’ use of the Advanced Photon Source was supported by the U.S. Department of Energy’s Office of Basic Energy Sciences. Yu’s Corbett Professorship also supported the studies. Using X-ray crystallography (including X-ray beams produced by the Advanced Photon Source), the researchers saw the MtrF and YdaH proteins were two-part molecules with nearly identical structures and bowl shapes. Both have the same number of transmembrane helices and hairpins. Both looked to be pathways in or out of the cell. Initially, the researchers thought the proteins were a part of the cell membrane that imported metabolites into the cell to promote growth and division. With further study, including measurements of the accumulation of radioactive sulfonamide, they concluded the two proteins are efflux pumps responsible for moving substances out of the cell. In these two bacteria, the pumps remove sulfonamide antibiotics, allowing the bacteria to survive treatment with the drugs. Research teams led by Edward Yu of Iowa State University and the Ames Laboratory have described the structure of two closely related protein pumps that allow bacteria to resist certain medications. The findings have just been published by Nature Communications and as the April 7 cover paper in Cell Reports.